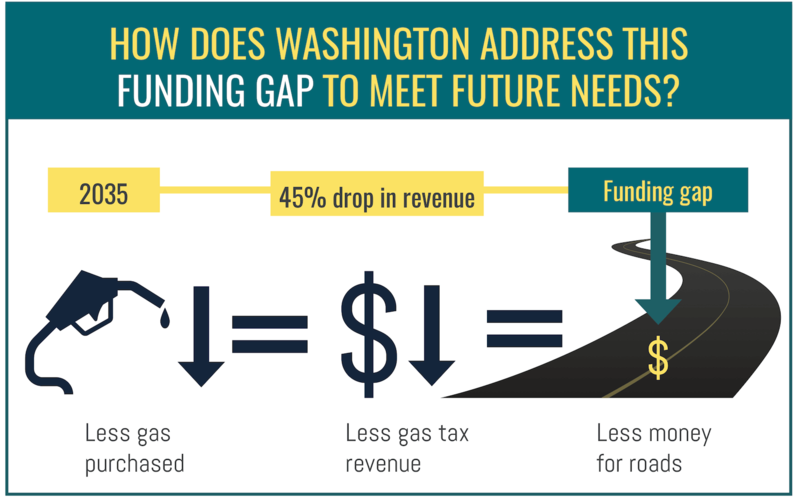 Washington is exploring a potential gas tax replacement to fund our roads and bridges. Conducted by the Washington State Transportation Commission (WSTC), the test-driving phase of the Washington Road Usage Charge (WA RUC) Pilot Project ended in January 2019. Approximately 2,000 drivers participated in the year-long WA RUC Pilot Project, reported their mileage, and provided feedback to help state decision-makers understand if this potential policy could work for Washington drivers. Now that the test-driving phase of the pilot is complete, the information collected during the pilot will be compiled and analyzed over the coming months, and a comprehensive report of findings and recommendations will be submitted to the Governor, the State Legislature, and United State Department of Transportation (USDOT) in early 2020. WHY TEST A ROAD USAGE CHARGE? Did you know that the current gas tax of 49.4 cents per gallon is used to fund the state’s roads and bridges? As cars become increasingly more fuel efficient and as more electric vehicles are on the road, gas tax revenue used to support our roads and bridges will decrease more each year. To ensure stable, long-term funding, we need to change the way we pay for our roads. A road usage charge (RUC) system is a per-mile charge drivers would pay based on how many miles you drive, not how much gas you consume. This approach is similar to how people pay for their utilities, including electricity or water. The WA RUC Pilot Project tested a mock 2.4-cent-per-mile road usage charge for light-weight, non-commercial vehicles including gasoline-fueled, hybrid, and electric vehicles. How does a road usage charge work for different drivers throughout the state? How do the different reporting methods tested work for drivers? Will a road usage charge enable us to better fund our transportation system in the future? The test-driving phase of the pilot is over, but our work isn’t over yet! As we process all the resulting information and work to submit recommendations to decision makers in early 2020, you can stay looped in by signing up for our email interest list. We’ll send you regular updates on the progress of the pilot study as work moves forward. Know someone who’d be interested in following along with the pilot? Spread the word!